Superlatives don’t really exist that can describe the essence of Mahina Surf on West Maui. It is in a class of its own that you will soon realize when you look out across manicured gardens, bursting with color, to an ocean panorama framed by swaying palms. If you come during winter months and early spring you will see humpback whales right out front in Molokai Channel while you are preparing your seared Ahi on the waterfront grill. If you can’t make it then, the resident sea turtles will give you plenty of joy most any time as they gather their dinner in front of you along the shoreline. And then there is the sunset. It’s great from any place on Maui that you can catch it, but I’ve used up more gigabytes on my camera right from Mahina Surf than I care to mention and I am not done yet! Your friends back home will probably think you photo-shopped your images. You’ll just have to convince them to check it out for themselves. 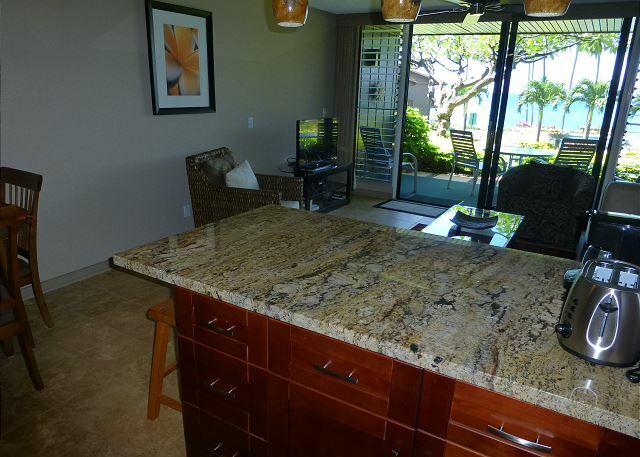 I have been coming to West Maui for the last 21 years as my Hawaii destination of choice and pounced on the opportunity to buy unit #115 when it finally came available. I had noted its prime position in the complex which offers both privacy, ease of access and ‘to die for’ views. I also came to appreciate the great staff that looks after the guests and the grounds. 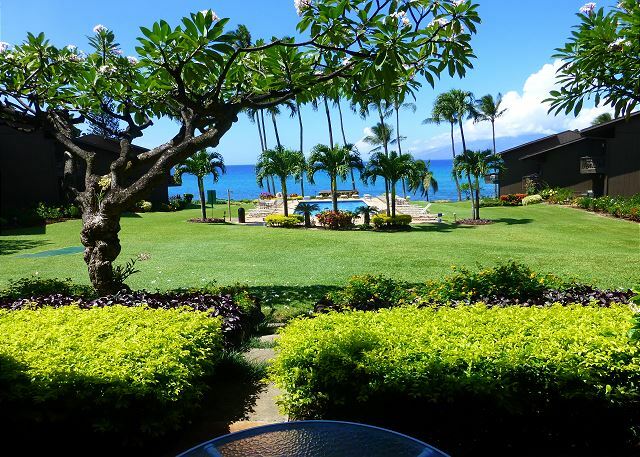 Unit # 115 at Mahina Surf enjoys a spectacular unobstructed outlook to the ocean with palms and flower decked grounds in the foreground. 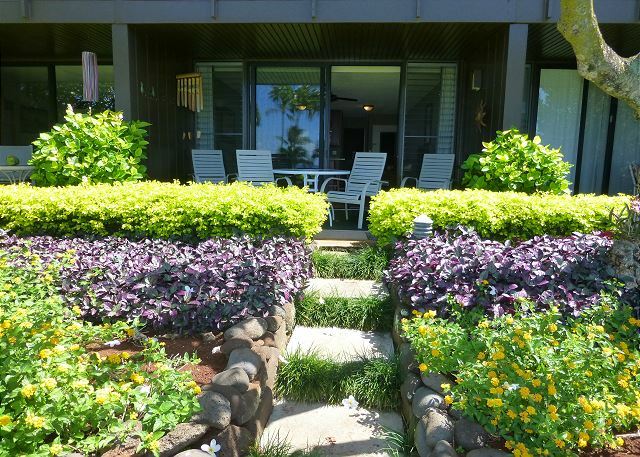 Sitting in the private, elevated garden lanai or inside preparing a tropical taste treat in the kitchen, you are always aware of the captivating setting. 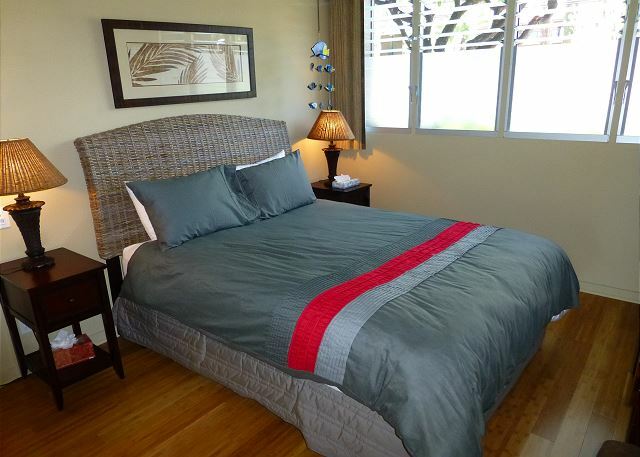 Furnished in a modern Hawaiiana style, the unit features travertine stone floors in the living, dining, kitchen and bath areas with solid bamboo in the bedroom. 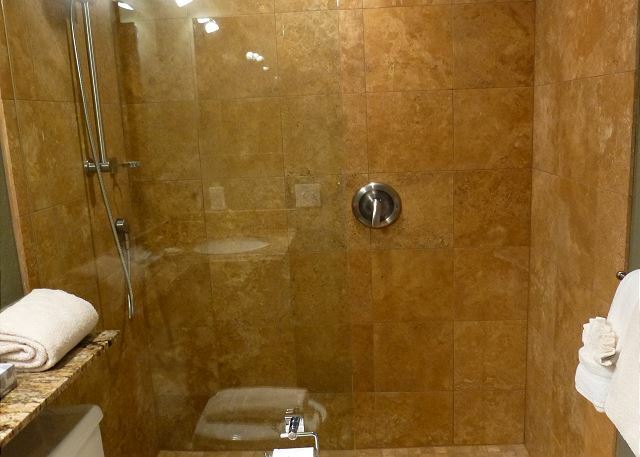 The shower is a walk-in with travertine surrounds. 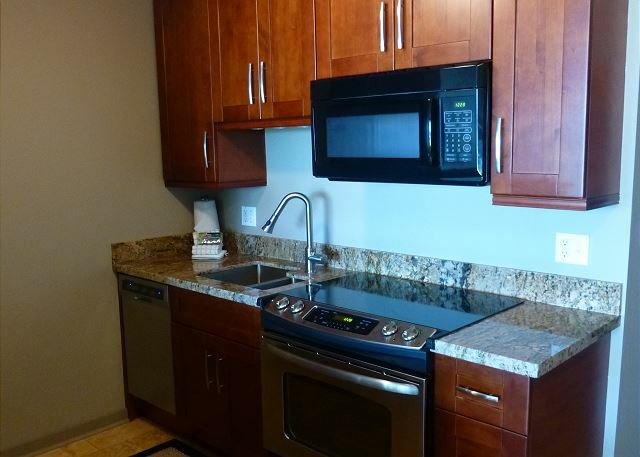 Granite counter tops and modern appliances and fixtures complete the luxury feel of this special unit. 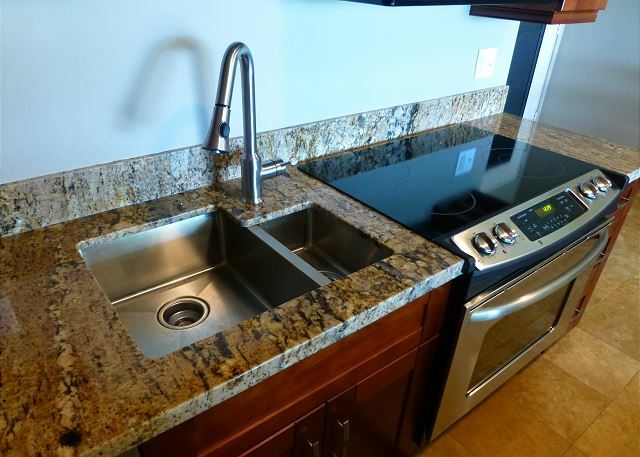 Being on the ground floor, you have easy and direct access to the heated salt water pool, the giant sea turtles’ shoreline habitat, the fabulous BBQ’s and parking. And speaking of the pool, for those times when you just want to relax, the salt water pool is, in my humble estimation, one of the finest on West Maui. Views out to the ocean from in the pool or from your deck chair are mesmerizing. A drink in hand often helps expand the experience. 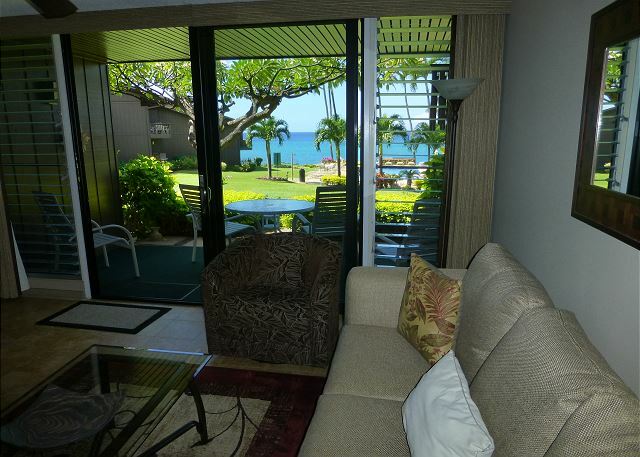 When done poolside, retreat to your lanai, still enjoying the ever changing outlook, and give some thought to dinner. 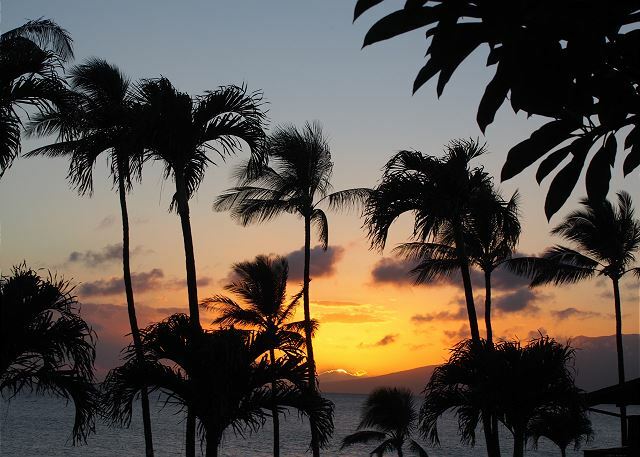 The range of choice is almost overwhelming and it will take several trips to Maui before you have even scratched the surface. Should you choose to stay at ‘home’ for dinner, perhaps something from the local fish market will suit and allow you to test your skills on the waterfront grills. 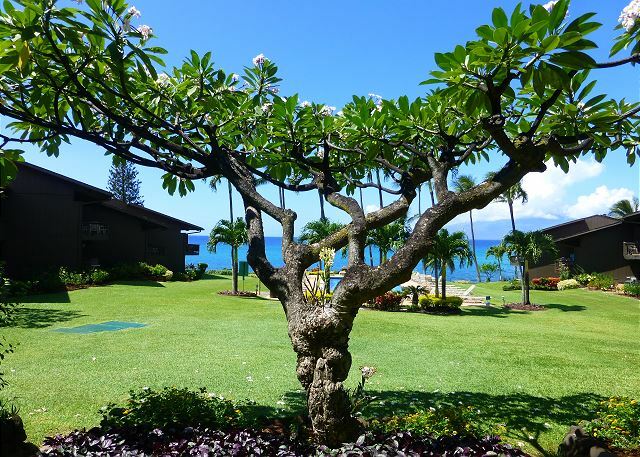 Guarantee – you will not starve on Maui, and this is good, as you do have to keep your energy level up to partake in all that is available on the Island. Welcome to an unforgettable experience. Hope you can make it. 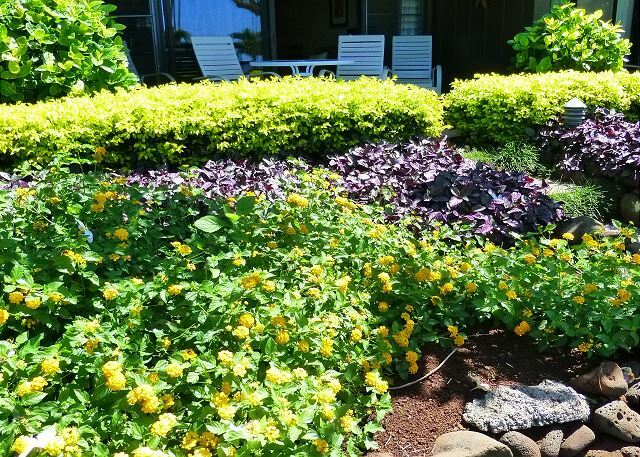 We greatly enjoyed our week-long stay at Mahina Surf, especially the beautiful view from our patio, the well-manicured and lush landscaping, and the on-site amenities (coin laundry, pool). We really liked the smaller size of this complex, making for easy parking and the ability to meet some other guests. 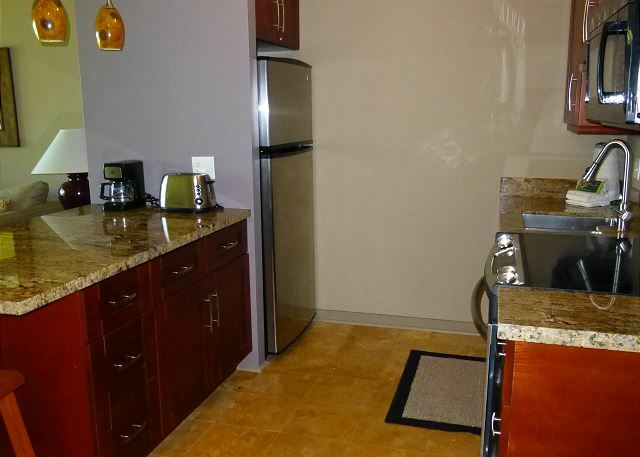 The unit itself met our needs and the kitchen and bathroom had recently been renovated. 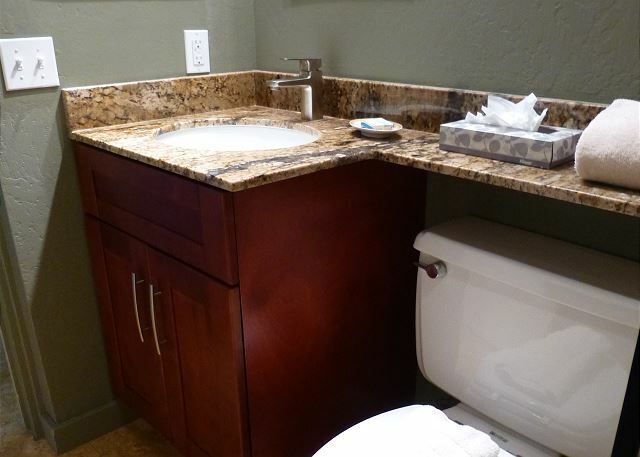 One recommendation is to increase the amount of paper towels and toilet paper left for guests staying a week, as we had to buy more. Additionally, it would be helpful if the unit had some cleaning supplies so we could more thoroughly clean counters, wipe up spills, etc. We really liked Sharon in the rents office and she provided helpful information! We would definitely stay here again! Loved 208 with giant travel posters setting the mood. 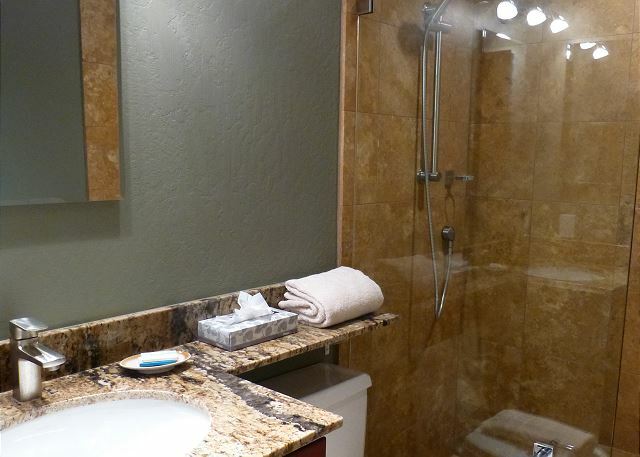 Beautiful tile floors, nicely appointed bedrooms. Tile bathrooms, well appointed kitchen with granite counters, comfy couch, dining area with extra chairs plus table and chairs on the lanai. Loved the ocean views and evening shimmer of the pool. Sunsets glorious from the lanai. Enjoy the master bedroom t.v. Andoversized t.v., in livingroom t.v. Quiet location convenient to the pool. Loved unit 208, will book again. 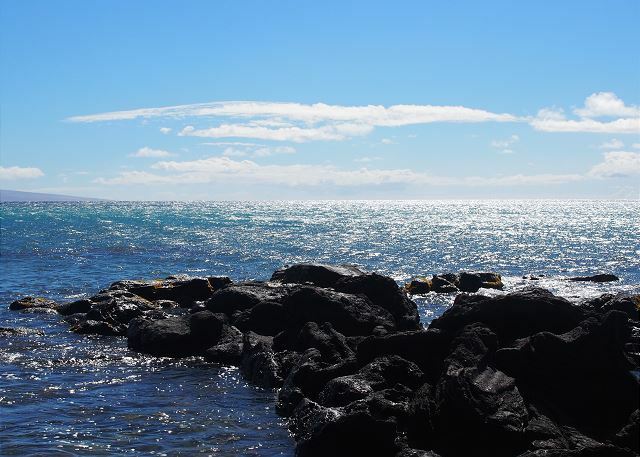 We Love the best kept secret in Maui! We loved everything but the No AC! Beautiful views , convenient to everything and the sea turtles were amazing! If you come for peaceful relaxation this is the place! Kevin C from Vancouver, WA does not recommend this vacation rental. I loved the room however there is no AC and that is a major problem for me. I cant sleep in hot weather and when the room is 80 degrees every night its miserable. Never sleep at all the entire week I was there. The location, grounds and layout of the buildings with superb view of the ocean could not be beat. The one thing that would approve a future stay would be the addition of air conditioning. As a family, we all needed to change from Jan/2017 to a late Mar/2017 visit and the humidity was stifling. It was very difficult to sleep at night, but overall we enjoyed our trip, even with the monsoon that hit on Apr 3. 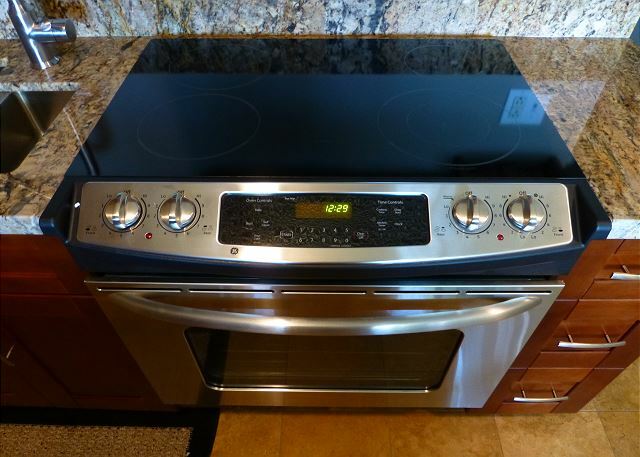 The staff could not have been more accommodating, our unit was welcoming and recently renovated to a nice standard, especially the kitchen and bathrooms. The only thing I would recommend changing is the heavy duvet in the bedroom. But overall, our compliments to the owner of Unit #115. 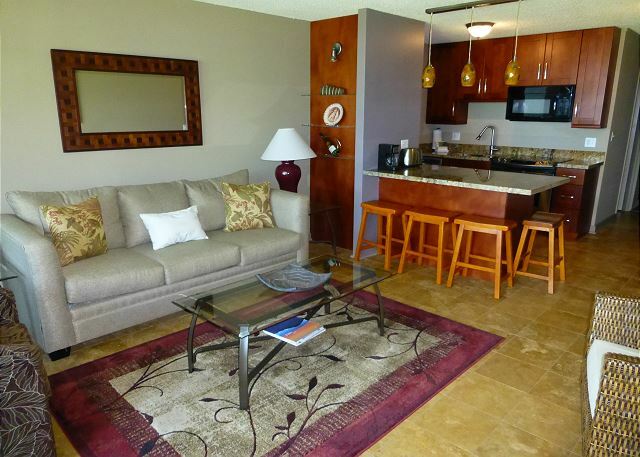 We stayed at Mahina Surf for our first trip to Maui. It was wonderful! The yard was clean and well manicured. The pool was beautiful and the shoreline was great. It was cool lava rocks and we got to see a lot of sea turtles up close. 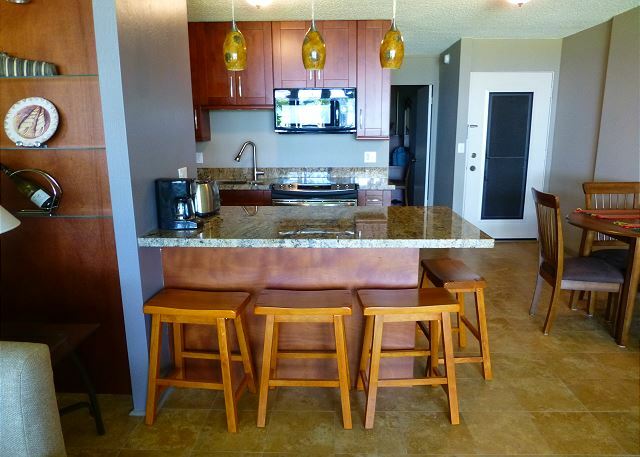 The condo was clean and a great view of the ocean. Im so happy we chose Mahina Surf and will definitely be back. 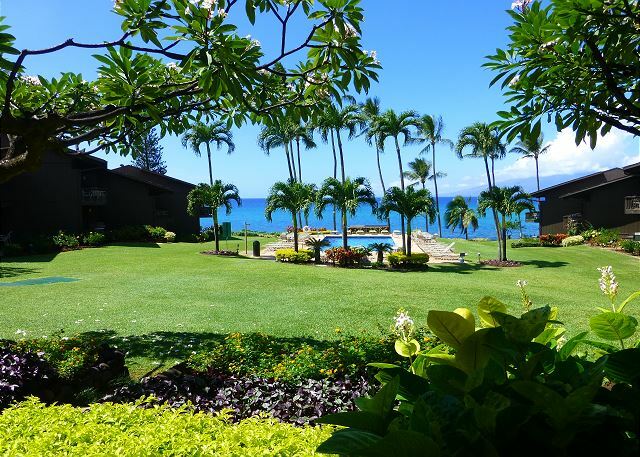 I am hooked on Maui and this is the best hidden gem I found to stay! Everyone was so friendly! Don’t want to write this review so its available next time!!! This place was amazing!! We spent our honeymoon here and the people were so friendly. The view is amazing. If you want to see turtles it is true that the habitat for the turtles are right there. We seen so many amazing ocean animals. The sunset was beautiful. Would I stay here again? Absolutely!!!!! The front desk was friendly and the room was perfect!! It was very clean and it was perfect!! It was close to everything but was was even better was the location. You were close to everthing but had a at home experience and not all the other tourists! It was private little area. I cant write enough to say was an amazing affordable place this is! The view is amazing! The grounds of the complex are well maintained and very lovely. The condo itself was very nice. Only complaint is that there is no ac, however their are ceiling fans and a plug in fan if needed. Not a big deal since we visited in February but might be problematic/uncomfortable during the summer months. Great vacation and we would definitely stay here again. Thank you! 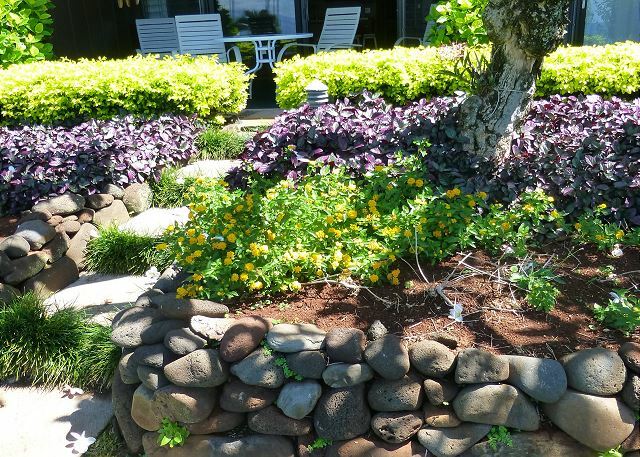 We had a wonderful stay in this beautiful property on Maui. 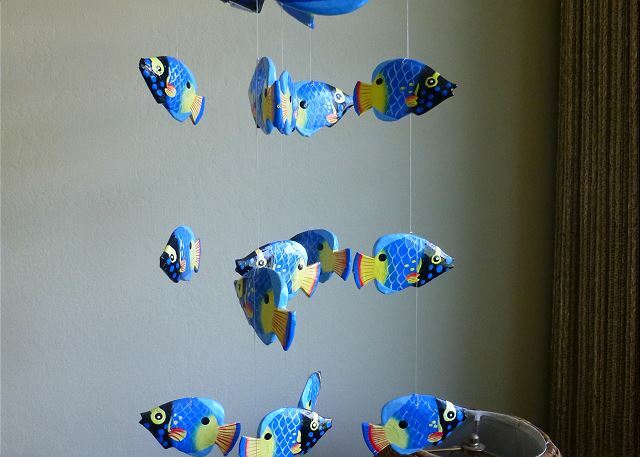 Ideally located for snorkeling at several choice locations. We watched turtles in the morning and enjoyed sunsets on the property's beachfront. The grounds are well kept attracting many birds and butterflies. We LOVE Mahina Surf #115... We visit Maui for a few weeks every December and although we've tried other places, this is by far our favorite place to stay. Great location, gorgeous view and an amazing deal. Highly recommended!! 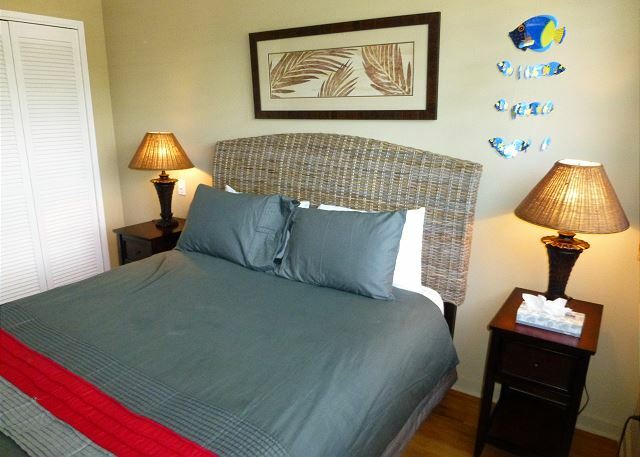 My husband and I enjoyed our stay at Mahina Surf. 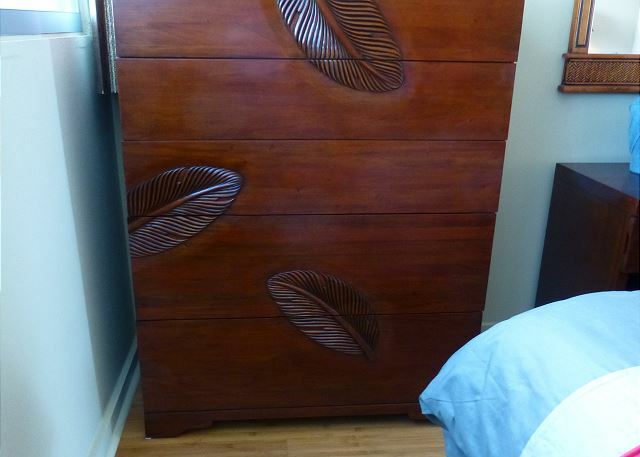 The unit was very clean and had everything we needed for our 5 night stay. The view is stunning and the property is gorgeous. The public beach down the road had sea turtles swimming around which was really fun to see. I didn’t realize there was no A/C in the unit (which seems to be the norm here) and for the most part it wasn’t a big deal, just would have liked a space to cool off when coming home from the beach. The other thing to be prepared for is you’ll have to drive to any restaurants and swimmable beaches. 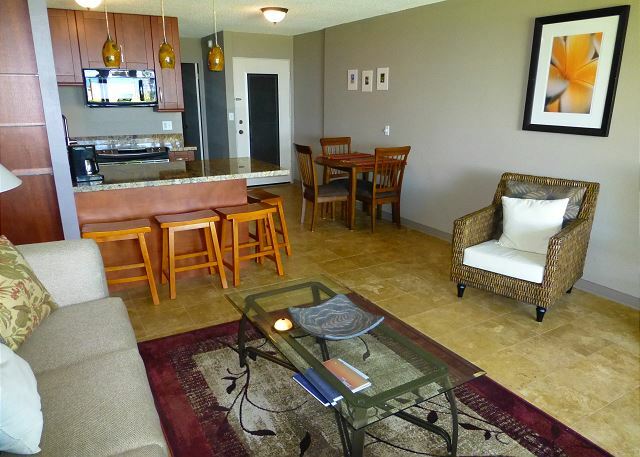 The condo was very nice, the only real negatives to me were that the bed was not particularly comfortable and the bedroom backs up to the parking lot. Since we had to leave the windows open to get some airflow at night we couldn’t close the drapes and we’d see headlights shining in the windows and hear the cars in the parking lot all night. Other than that it was a very nice unit and we enjoyed our stay there.